Forget about keeping up with the Joneses. 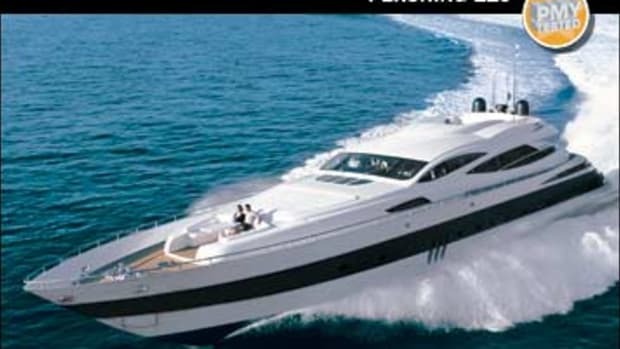 with ZF Searex surface drives and nearly 5,000 horsepower, the Pershing 82 will blow right by them. 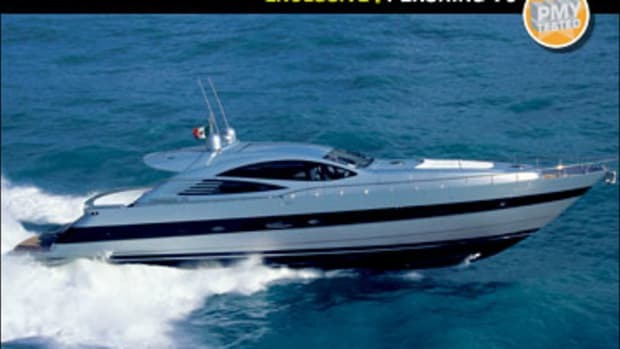 There are not many areas where you can say that a Pershing is just the same as every other boat. But there is one—the standard hull color is white. With that said though, I don’t remember when I last saw a white Pershing. You see them gleaming in silver and gold, in bronze and aluminum—but never white. I saw one once that I thought was white, but it turned out on closer inspection to have a pearlescent luster, like the inside of an oyster shell. These incredible paint jobs are from the top of the options list, but there’s something about them that seems to be compulsory. The “aluminum silver” paint finish on this Pershing 82, which we tested off Cannes last fall, cost its owner more than $300,000 before tax. 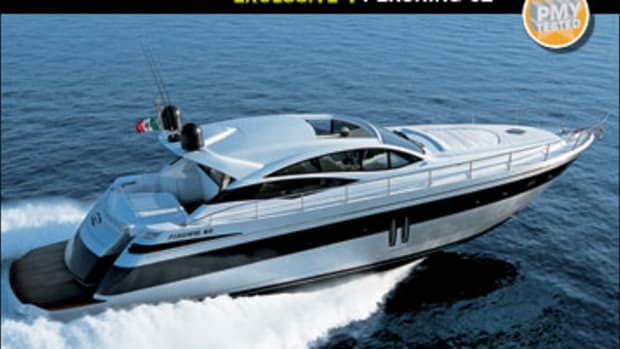 That’s the Pershing world—high-end boats for high-end people who like to keep up appearances. And if a shipyard has the sheer, barefaced chutzpah to charge that sort of money for paint, it had better be pretty sure that everything else about the boat is as close to perfect as man’s ingenuity can make it. Often that turns out to be the case. Of course you can take issue with things—there are very few interior handholds on the 82, for instance, which seems a bit silly for a boat. Even in the galley, none of the surfaces has any kind of lip or fiddle rail to stop things sliding onto the floor, which also seems a bit silly on a boat. The saloon seating and dining suite are all free-standing—not very nautical. And the guardrails on the flying bridge are shamefully low. But to level these remarks as criticisms, to imply that with a little bit of effort Pershing could do better, is to miss the point—which is that this is exactly how the boat is meant to be. Pershings are designed and built with such confidence it borders on conceit. You start questioning your own convictions—are they just prejudices? Does it really matter if things slide onto the floor? It’s the Pershing world. Get used to it—there is much to enjoy. The 82’s interior design could grace a Manhattan loft apartment, with its natural, dark-stained oak and Poltrona Frau leather, the latter not just upholstering the furniture but lining the bulkheads too. Look at that ultra-smart stainless steel and glass dining table, those mosaic-tiled shower compartments, the aluminum-slatted blinds and LED lighting. Big windows on both decks fill the interior with sunlight, and in spite of the upstairs sun deck—it’s not really a flying bridge—there is still a substantial opening sunroof above the lower helm station. Bright, roomy, and rational, the Pershing 82 is a pleasure to be aboard, and the saloon feels unusually spacious thanks to the decision to place the galley below, in the crew quarters. Sitting directly beneath the saloon, it connects to the main deck and dining area via a curved, six-step companionway on the port side. The guest accommodation is reached down the forward companionway. A full-beam master suite gets the lion’s share of space, with its walk-in wardrobe, excellent glass-doored shower and head compartment and deckhead-mounted TV. The king-sized berth lies athwartships, below that huge window. There is a small fridge for drinks, and adequate stowage in lockers and drawers. By comparison the forward VIP suite feels a little small, and looks a little light on stowage. Big windows in the hullsides let in plenty of daylight, however. Of the two twin-berth guest cabins, one has en suite access to the dayhead and shower. As an alternative to this four-cabin arrangement, the 82’s optional accommodation layout replaces the starboard guest cabin with a TV and video lounge, complete with a big screen and huge sofa. With just the three head compartments available—whichever layout you opt for—I suspect a lot of owners will probably choose the comfort and space of the three-cabin version. Along with an extended aft platform it is the new topside sun deck that differentiates the Pershing 82 from the 80 it replaces. With its clever curved seats that unfold into sunpads, this area is primarily intended for relaxation, although it can be fitted with a basic upper helm station, which folds down when not in use. 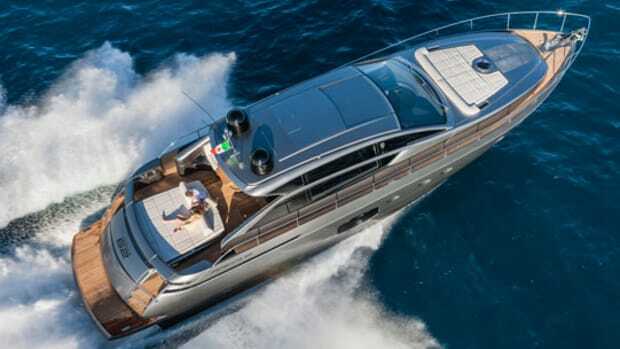 The carbon-fiber steps that carry you up there disappear into the overhang so as not to clutter the cockpit, and there is plenty more seating and sunbathing space on the foredeck. The tender, in this case a 10-foot Williams 325 jet RIB, is stored in the garage under a huge stern hatch, and launched and recovered on a simple extending ramp. There is also room in there for a PWC. 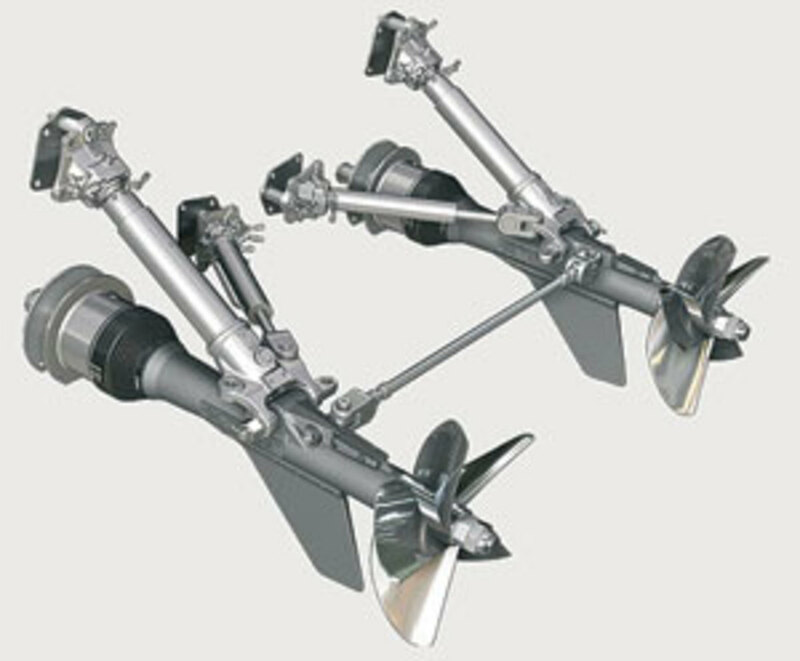 The Pershing 82 uses ZF’s strong SeaRex surface drives. These next-generation units are designed to accommodate a whole lot more torque than previous models. The engine room is reached via the crew accommodation. 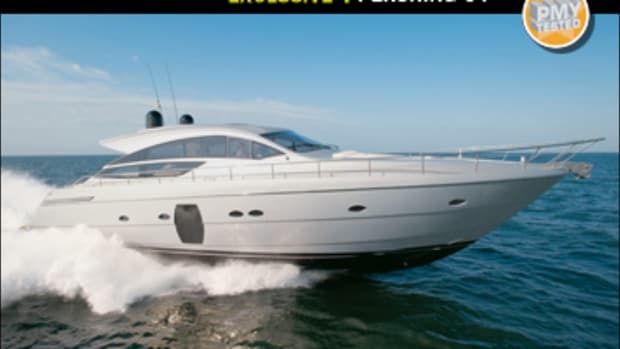 Typically for a Pershing it is beautifully engineered and packed full of machinery, with the generators aft, and crouching-room only between the two giant MTUs. Tipping the scales around three tons lighter than the older 80, the Pershing 82 is molded using vacuum-infusion and E-glass, for strength and weight reduction. Hull, topsides, and deck are all balsa-cored, with the hull bottom laminate some 1½ inches thick. 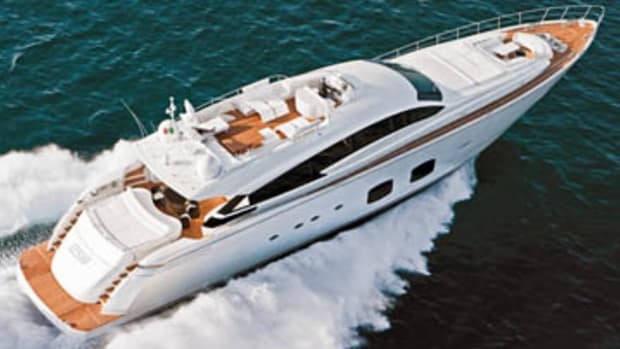 Such a heavy-duty layup is essential if you’re as serious about performance as Pershing, and with ZF SeaRex surface drives, Rolla props, and huge V-16s providing nearly 5,000 horsepower, there are very few motoryachts, let alone loft apartments, that can match the 82’s power-to-weight ratio. The substantial three-seat helm station is a statement of intent. Helm ergonomics are excellent: although the console is massive, the throttles are mounted to the right of the central seat, just under the driver’s hand, with a small electronic tiller to the left. Flap indicators and drive-trim gauges are given even more prominence than the compass, and their control toggles are placed right in front of the wheel. It’s a layout that has been put together with as much care as on a racing car or a fighter jet—and once you get the 82 going, you can understand why. A small stick of a steering tiller poking up under your left hand seems like a joke on a 55-ton, 46-knot boat, but it works. There is full computer control in place to limit the steering angle of the surface drives—presumably in case you sneeze—while drive trim is also controlled automatically. This works like a dream—I certainly couldn’t do it any better. That might not be saying much, but it’s a moot point. 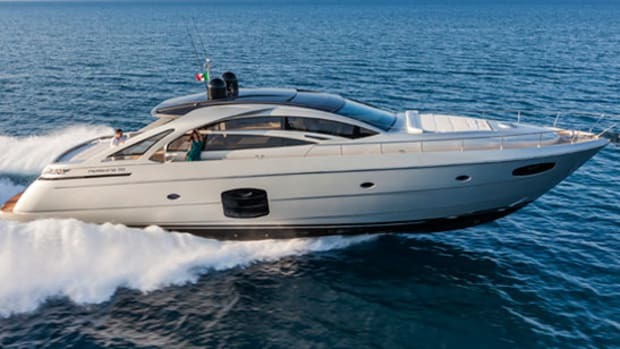 Pershing has realized that many experienced yacht captains have had little opportunity to amass much sea time in high-performance motoryachts such as the 82. Surface drives take time to master. Just a degree or two can make a big difference to performance and fuel efficiency. But now any skipper can switch on and go, safe in the knowledge that he’ll be able to achieve the yacht’s advertised range and speed. Automation also makes the 82 a lot of fun to drive, as it frees you to focus on where you’re going—because wherever it is, you’re getting there awfully fast. Pershings are generally stupendous driver’s machines, and the 82 is no exception—helm limiter or no, it heeled over like a raceboat and turned like a dog chasing its tail. 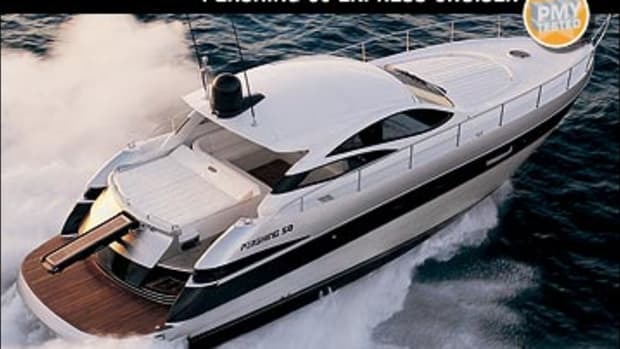 Typically for a surface-drive boat, once up on plane the Pershing gives better fuel mileage the faster you go, so there is every incentive to simply floor it. The Baie de Cannes might be three miles across, but it seems an awfully small place at 45 knots. 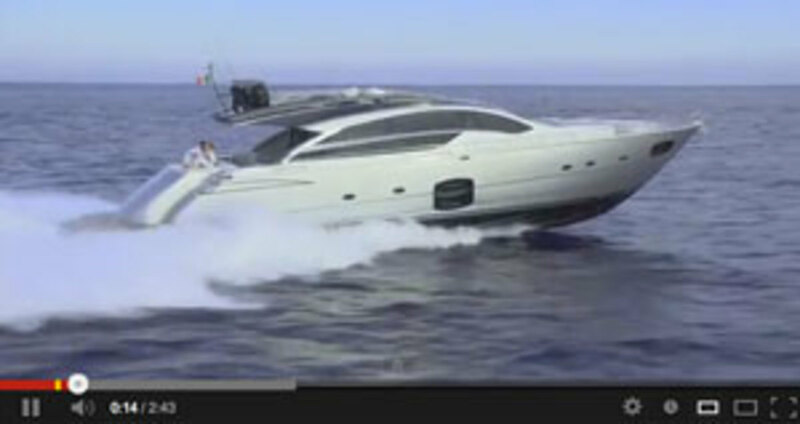 Then it was a question of eyeing the plotter and choosing which way to turn—starboard for St. Tropez, or port to Monaco? Neither was more than half an hour away. What about south, to Corsica? The port of Calvi was three hours, max. Choices, choices—it’s the Pershing world. I think I could get used to it. 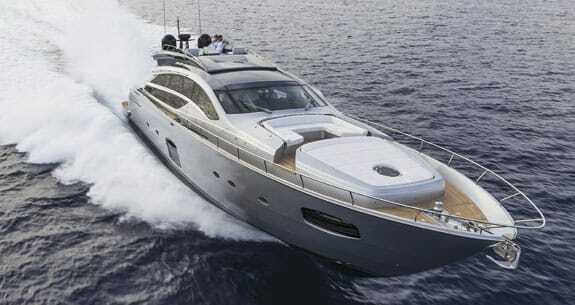 NOTEWORTHY OPTIONS: Silver hull and superstructure paint ($333,270); 150,000-Btu super-tropical air-conditioning ($29,121); upper helm station ($58,242). 475 gal. fuel, 317 gal. water, 15 persons, 880 lb. gear.